Behold the humble green bean, a vegetable that most people don’t give its due. It’s fast becoming one of my favorite summer vegetables, even more than tomatoes, peppers and eggplant. It’s featured in so many different dishes, from contorni such as “fagiolini alla Genovese” (green beans in the style of Genova) to main dishes such as “stufato di verdure” (vegetable stew). Long, slow-cooking, is what you need to get the best out of a green bean when it comes to Italian food. We won’t deal with any of the usual steaming-until-barely-crisp-tender business. That’s a story for another time. Adapted from this recipe at About.com. Although the recipe head notes list this as Puglian, the spelling is Sicilian which suggests to me that there may have been some crossover in times past. The key to this recipe is a base of onion, fried slowly in olive oil until the onions are golden brown. This is a process that will take some time, about 30 minutes. It’s not something that you can rush. Cooking them in this manner will slowly mellow them, transforming them into something luscious, soft and sweet. Bring a large pot of lightly salted water to a boil. Add the green beans, bring to a boil, then reduce heat to low and simmer for 10-15 minutes, then drain. Warm olive oil in a skillet over medium heat, then add the onion. Sauté the onion, stirring occasionally, until the onion becomes golden brown, about half an hour. Add the green beans to the pan, along with the Italian parsley and mint. Cook, tossing the beans and onion frequently, or until the beans are warmed through. Stir in the lemon juice, then taste for salt and pepper. Sprinkle with bread crumbs, if desired, then serve immediately. This recipe is sized for 4 side-dish servings. Time: About 1 hour, 15 minutes, including prep. Note: For those of you who are afflicted with celiac disease, bread crumbs made from gluten-free bread will be fine. That being said, the beans are delicious enough that if you omit the bread crumbs, you won’t be missing anything. 13 Aug	This entry was published on August 13, 2013 at 11:41 am. It’s filed under food, food photography, Gluten-Free, Italian food, recipe, summer, vegan, vegetarian and tagged food photography, gluten-free, green beans, Italian food, onion, side dish, summer, vegan, vegetarian. Bookmark the permalink. Follow any comments here with the RSS feed for this post. I have another one scheduled for tomorrow, on an Italian classic. Just trying to highlight some other vegetables beyond the usual tomatoes, peppers, corn and eggplant. All those you mentioned are my favorites, plus asparagus and Brussels sprouts. 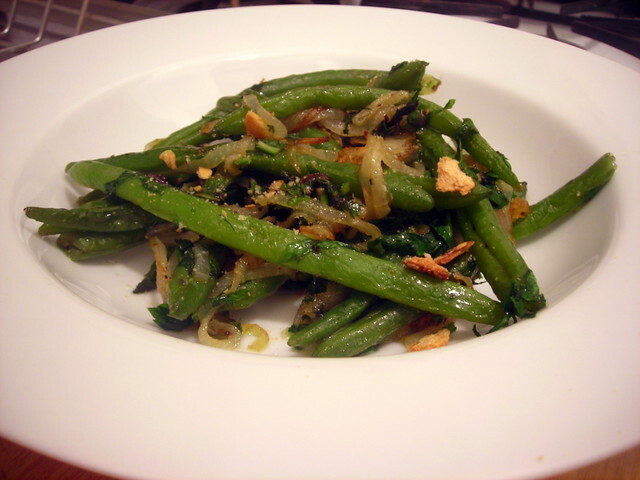 I’m amazed that your green beans are still so vibrantly green after being cooked so long. Is it the low heat that doesn’t turn them brown as they do when they’re over boiled? They’re not THAT green, trust me. It’s probably a combination of low heat and the fact that they’re not immersed in liquid, unlike the green bean recipe in today’s post, or the pic of the stufato di verdure that I posted a couple of weeks ago.